We conduct a comprehensive assessment of all security and insurance needs. 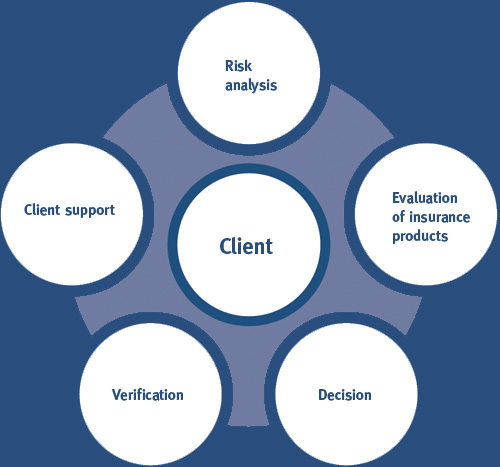 By analysing the risks we establish the precise insurance requirements for each client. On the basis of our requirement profile, we obtain quotes from different insurance companies. Our clients then receive a comparison of these quotes for evaluation. We compile all the information necessary to allow our clients to make an informed decision in choosing their future insurance partner. Upon receipt of the contract, we verify all the relevant points agreed with the client. We take care of day-to-day business, manage the policies and monitor all insurance contracts. We actively provide advice and support to our clients in connection with claims settlement.